A full field of 75 tee off in Port St. Lucie, FL. 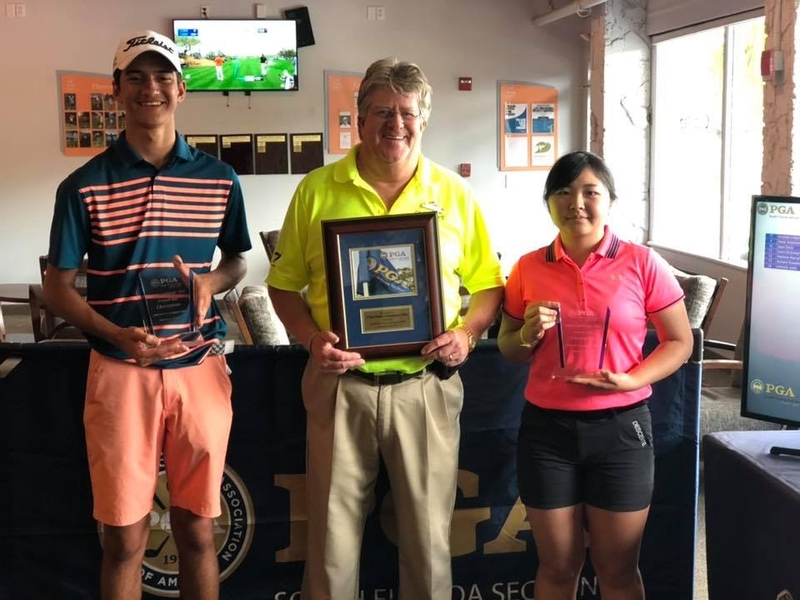 ATLANTIS, Fla. – This weekend, the South Florida PGA Junior Challenge Tour presented by The Honda Classic held Challenge Event #1 at Sandpiper Bay Golf Club at Club Med in Port St. Lucie, FL. This event was the first Challenge Tour Event of the 2019 season. Carlos Caloca of Delray Beach, FL won his first South Florida PGA Junior Tour event of his career this weekend. After shooting just 3 over par, Caloca entered Sunday tied for the lead with Port St. Lucie, FL resident Callen Hoskins. Hoskins had the advantage as Sandpiper Bay Golf Club is his home course. Both juniors battled through nerves all day, but in the end, Caloca was able to edge out the victory after rounds of 73-74. Callen Hoskins, ended up taking home the Boy’s 13-15 age division, while Port St. Lucie resident Alex Kim, took home the Boys 13-18 age division. Mayumi Umezu of Port St. Lucie, FL competed in her first SFPGA tournament ever. Opening with a spectacular round of even par she had the lead by 5. Firing back in round two with an impressive 71, one over par she was able to take home the overall Girls 13-18 division. The Girls 13-15 division had a close leaderboard throughout the weekend. Jade Scott, of Lauderhill, FL grinded out the whole weekend against a familiar competitor Nicole Yugay. Scott walked away victorious after two impressive rounds of 78-75, Yugay was one back after shooting 80-74. In the Girls 16-18 division, Kira Shellman took home the first place trophy shooting 83-78. Pavel Tsar, of Palm Beach Gardens, FL captured the Boys 11-12 division with two outstanding rounds at 70-76. In the Girls 11-12 division, Layla Pedrique took home victory after shooting 79-74.